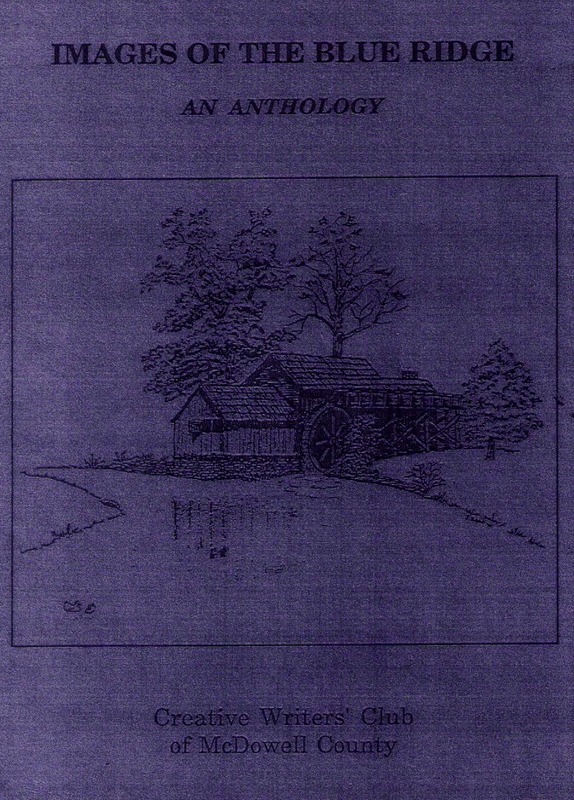 An Anthology by the Creative Writers’ Club of McDowell County 1990. Reginald was creeping noiselessy through the gravelly, swamp-pitted river bottom. It was a place of dense shade, tangled vegetation, and mosquitoes whining in the sweltering summer heat. His grandpa Amous had bought this tract of land straddling the McDowell-Rutherford line in 1846. Many of the years from that time until he went into the Civil War he had devoted to mining operations thereon. Now, at the time of World War I, the area was grotesquely sculptured into incongruous pits, mounds, miniature hills, and ditches among thick timber. But, as Reginald had intensely in his mind, it was a haven for those rascally but succlulent squirrels! He felt desperately inclined to cuss to the full ability of his eleven-year-old vocabulary. But Papa ‘Minter was a conscientious, precisely-spoken man who almost never uttered anything untoward. And Mama, now Mama Mercilla was most determined that her only son after a string of six daughters was going to be a “good little boy.” The heart rending loss of three of the girls had left her with a great diligence to “do right by” her remaining children. So Reginald didn’t cuss. But he felt like it! “Don’t care if that ol’ squirrel’s got a pile of wuffs in it, even. Pluck ’em out and proceed!” he avowed, thinking of the summertime parasites that often infested many members of the animal populace. Reginald paused reflectively, looking around the odd area, thinking of the momentous changes in his little world during the past two or three startling years. One event in particular stood out in his mind–the catastrophe that ultimately had resulted in his present state of mind. 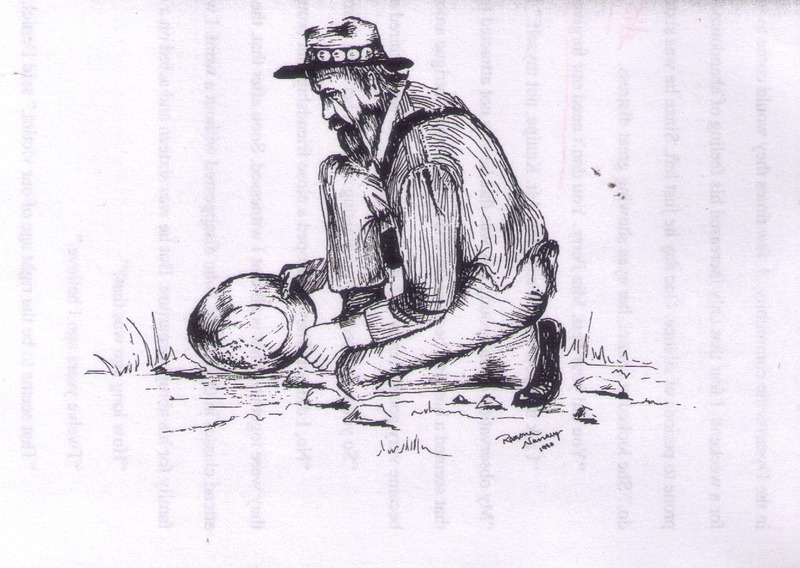 He took note that the deeper pits resulting from those primitive old mining techniques were still unusually brimful of water. 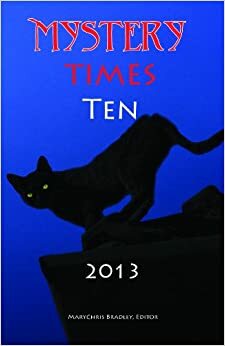 But he thought back even before that natural occurrence that had deluged the area–back to events that presaged a time of momentous changes in the world, near and far. In 1914 they had heard reports of some huge conflict in Europe. The following year brought news of the Germans sinking a huge ocean liner with lots of Americans on board. That generated rumors to the effect that the U.S. might get involved. About that time, one still morning, the family members were suddenly aware that a bizarre droning sound could be heard in the distance. They all exited the house and began earnestly trying to discern just what was producing such an odd noise. “Nothin’ showing up on either railroad track,” Papa observed. “Road’s clear all up ‘n’ down,” Mama contributed. But the mysterious sound kept intensifying, seemingly drawing nearer and nearer. Reginald suddenly noticed that ol’ Charlie Wilkings was becoming highly agitated, trying to communicate something or other. Charlie, who was renowned in the area for his stuttering, had happened by that morning heading for Horne’s Mill to get some sacks of grain ground. Charlie stood there gesturing aloft, his mouth agape, essaying with all his might to put a certain knowledge into words. “Hit’s a…yup…yup…yup-a yoop…yoop…yur…yur-o-pean flyin’ machine!” Charlie finally got it out, introducing his listeners to the realities of the air age. This was still a time and area in which the age of the automobile was still relatively new. It would yet be about thirteen years until the construction of US 221 down through the bottom, but an occasional primitive vehicle came put-putting along the old wagon road that meandered over the landscape between Marion and Rutherfordton. Yes, it was a gentle, orderly little world, the time of Reginald’s childhood. That is, until the Big Event. Who would ever imagine a hurricane penetrating so far inland as to hit the Blue Ridge Mountains? But TWO hurricanes? At the same time? Jake was an energetic young man of 20 at the time. He had at an early age set his mind on becoming a “train man.” Even when near-fatal polio crippled one of his legs, he was undaunted. He merely made a slight adjustment in his goal: he would become a depot agent. He indeed wound up serving in such capacity at the Marion depot for an unprecedented 44 years. However, in the summer of 1916 he was doing on-the-job training, without pay, under Mr. A.P. (Dolly) Poteat at the Glenwood Depot. This depot was situated about a third of a mile south of a relatively high trestle over Muddy Creek. Just to the other side of the trestle, through a long shallow cut, stood Dolly’s quaint three-story house. By late afternoon the day of the flood, the valley land had been transformed into a vast network of lakes laden with muddy water and debris. The depth of the water was so remarkable that by then the depot itself stood in about 3 feet of it. Nevertheless, Mr. Dolly was determined to get home for supper. Reginald returned to the present reality of the swamp-pitted river bottom. “What’s that?” There was the rustle and flicker of a squirrel cavorting from tree to tree up ahead, silhouetted against the bright afternoon sky. “Can’t quite draw a clear bead on ‘im from here,” he reflected as he began to silently stalk toward his unwary prey. “Soon’s I get on t’other side o’ this here ol’ log…” WHAM! “Ehhheeek!” he screamed in stark pain and terror as a debilitating sickness instantly spread throughout his slim young body. He then frantically began to thrust downward with his rifle stock, beating and crushing a fat, copperish-colored viper that had sunk its fangs into the side of his bare foot. After several increasingly vehement blows the doomed snake released its grip. Reginald wasted no time dropping his rifle and turning homeward. As he walked, increasingly slower, traversing the densely wooded and vined area, his head buzzed inside, louder and louder, and his vision narrowed and blurred. 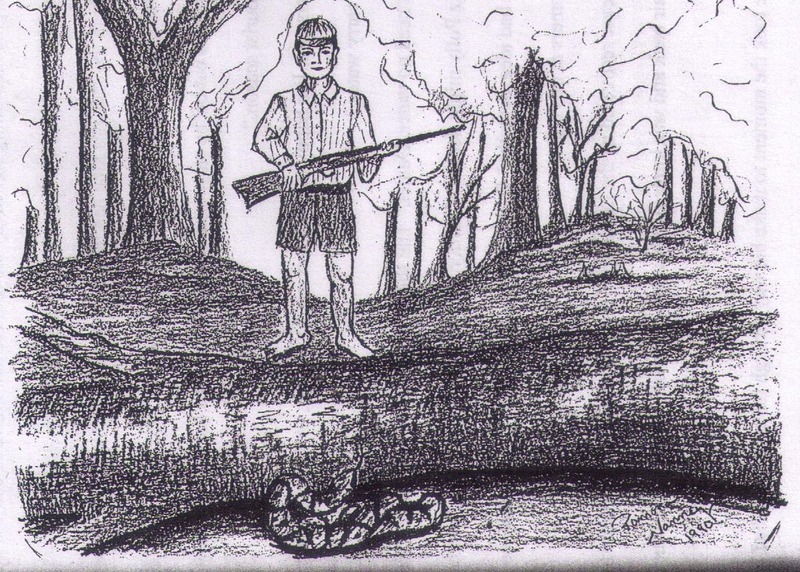 After what seemed hours, but was really no more than a few minutes, he broke into the clearing and entered the stand of field corn, which was growing to unprecedented heights in the rich dampness of that year following the big flood. Reginald’s mind and vision was becoming an increasingly dim and painful blur. He suddenly took note that he could see nothing all around except corn, corn and more cornstalks. This is scary, he thought. Gotta keep headed forward, crossways of the rows, else I’ll likely get turned around. At the next conscious recollection, he was in the roadbed on his hands and knees. Somehow, he couldn’t recall precisely, he’d put the cornfield behind him. But now, the steep hill leveling into the yard of the house lay ahead of him, appearing as an insurmountable wall. How could he ever…? “Mama!” He cried out in a feeble voice that nevertheless sounded thunderous inside his pained head. But Mama couldn’t hear her boy. She and his big sisters were back in the kitchen fixing supper, the main course of which was an ample bowl of those accursed peas. The deluge of the year before had left them in a proverbial pickle of a fix. In those days long before the supermarket era, country folks still raised most of what they ate. They bought only certain specialty items they couldn’t very well produce themselves. Thus, when the flood waters wiped out virtually all garden crops that early summer (July), Papa ‘Minter had been faced with the disturbing dilemma of how to feed a family of seven until the next year’s produce could be raised. The solution appeared one Saturday evening when he returned from a slow trek to Rutherfordton. The anxious family members were curious about several bulging sacks he was carrying on the all-purpose farm wagon. “Regnal!” A girl’s voice screamed from the front porch. One of his sisters had spotted him. “Mama! Mama! Something’s happened to Regnal,” she bellowed as she ran headlong through the house. Reginald had again by some miraculous means he couldn’t recall, climbed up the stone steps mounted in the high roadbank and followed the path on up to the edge of the yard about 50 feet from the house. His tormented head ached unbearably, and he felt so trembly weak and sick-stomached that he could scarcely speak audibly. “Mama, I been snake-bit,” he muttered haltingly as his terrified mother appeared. In those days still, the service of a doctor was often impossible to acquire without considerable delay, so folks mainly had to make do for themselves in emergency. The moonshine whiskey that in many circumstances met with great disapproval, nevertheless was prized for its medicinal qualities, real or supposed. The treatment administered to little Reginald consisted of pouring liberal quantities of it into him and letting him sweat. His concerned family knew little else to do considering that the venom was already thoroughly dispersed throughout his tissues. Four days in the sweltering heat of that memorable summer, they laid him on a pallet of quilts out in the yard under the big dogwood tree. Day after day,he lay there suffering and sweating, his senses dulled by the potent whiskey. Then, each night, he tossed and turned in his bed, finding only scant and troubled sleep. In later years, Reginald wouldn’t precisely obey his mama’s admonitions against “corn likker.” Although he, in a quiet but deeply serious and sincere manner, had a bent toward religion, he nevertheless developed a taste for an occasional generous swig. In his early married years during the Depression Era, he was wont to sip on the jug a bit on a sunny, warm Sunday afternoon. Then he would go out to a quiet, soft, sunbathed spot in the woods, lie down, and take a long and refreshing nap to recuperate from his previous week’s toll maintaining Southern Railway’s tracks. This little pastime worked well until one warm Sunday afternoon when he woke up to discover he had a bedfellow: a huge, sleek blacksnake snuggled up against his side, sleeping right along with him. The horrified Reginald took this as a Sign from God, and became an absolute teetotaler the remainder of his days. As the fourth day of this ordeal on the pallet drew to a close, Reginald clearly rallied, and his appetite returned. But never, ever for those cussed peas. All the rest of his life he despised that lowly member of the cowpea family. When in later years his wife Clara would occasionally cook some blackeyes, he would dutifully eat a few. But he would, with a martyred expression on his face, let it be known that he didn’t appreciate them at all. However, at no time did he ever fail to delight in his sumptuous stewed squirrel. It remained one of his choice delicacies. He would demonstrate great craftsman-like expertise in lifting a squirrel skull from the pot, taking careful aim with the edge of his fork, and cracking it open like a pecan shell. He would subsequently pluck out the tiny brain and feast. Reginald grew more than a foot in the succeeding years after that eventful summer of 1917, but the afflicted leg didn’t grow quite as much as the other. He therefore had a distinctive, slightly uneven walk. However, the apparent damage dealt his young kidneys by the snake venom and, too, perhaps by the remedy administered, was a slow ticking time bomb whose fuse ran out forty-three years later. One day in the autumn of 1960, returning home from one of his regular and frequent visits to his doctor, the now pitifully frail Reginald suddenly parked his ’48 Chevrolet beside the road just south of Marion, turned off the switch and quietly died sitting behind the wheel. Thus, he was doubtless a long-delayed, indirect victim of The Great Flood of Nineteen-Sixteen, and of that disgustingly memorable year that followed. This entry was posted in Guest, Nanney Saga, Setting and tagged Images of the Blue Ridge Anthology, Jones Reginald Nanney, Ramona Nanney, Regina Nanney, Troy Wade Nanney. Bookmark the permalink.